Original Sudoku is a puzzle magazine with over 180 puzzles separated under four difficulty levels of easy, medium, difficult and challenger. Original Sudoku was the first ever puzzle magazine to be published and it still is the leading magazine that sweeps everyone with a pleasurable time. Puzzles have always been a source of great entertainment and mental exercise. Sudoku tops the list with its excellent puzzles, clear layout, easy instructions and super fun. The magazine gets you engaged into a positive and productive usage of your leisure. You would only have to spend few minutes to understand the rules and then it will have you all set for hours of fun solving the irresistibly addictive Sudoku puzzles. With 8 issues per year, it is much loved magazine among the puzzle freaks. 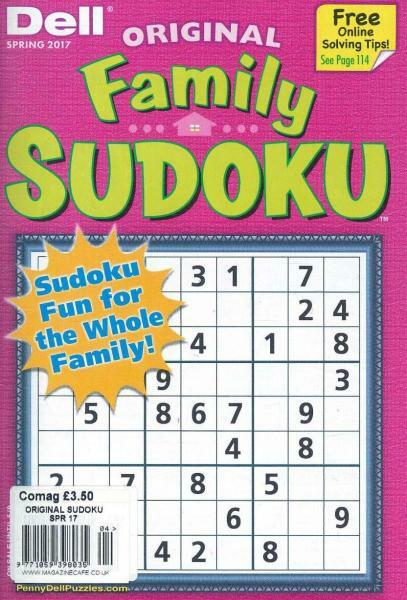 The Original Sudoku is recommended for anyone who loves to crack puzzles for pleasure or for a healthy mind exercise. With Original Sudoku you would never be bored as the magazine thrives to bring you newest puzzles with every issue, every time. These puzzles are specially created with specific difficulty levels so as to be enjoyed by puzzler of every age and skill level.